If you prefer to watch your horror movies at home with all the lights on, Netflix has you covered. The streaming giant has begun offering more thriller and horror flicks as of late, most of them based on equally-terrifying novels, like last year’s smash-hit Birdbox starring Sandra Bullock. Netflix’s newest horror offering is The Silence, which will really excite fans of John Krasinski’s 2018 directorial debut, A Quiet Place. 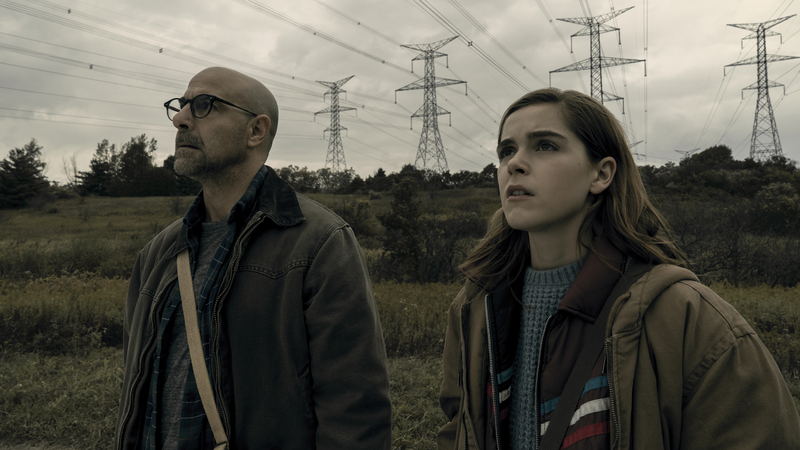 The Silence is yet another look at a post-apocalyptic, near-future world where creatures hunt their human prey by sound. In this case, 16 year-old Ally Andrews (Kiernan Shipka), who lost her hearing when she was 13, is being hunted not just by the bat-like creatures, but by a cult seeking to exploit her other, heightened senses. When she and her family (played by Stanley Tucci, Miranda Otto, Kyle Brietkopf and Kate Trotter) attempt to seek refuge from the creatures in a remote haven where silence reins, the cult arrives and, from what we can see in the trailer, all hell breaks loose. On Thursday, IGN released an exclusive first-look at The Silence, including a poster and quotes from Tucci about the film. Working with Anabelle director John R. Leonetti isn’t Tucci’s first time dabbling in sci-fi or horror, nor is it his costar Shipka’s — she currently stars as the titular character in the Netflix Original Series Chilling Adventures of Sabrina. The Silence is based on the novel of the same name by Tim Lebbon, who also wrote the apocalyptic horror novels The Cabin In the Woods and Thirty Days of Night, which were both adapted into successful films. We’re very eager to see how The Silence plays out, but it already looks amazing. The Silence hits Netflix on Wednesday, April 10.